Purchase the bundled set of Juliette and SAVE 30%! Part of the March 2015 BYOC (Build Your Own Collab). Includes a small selection of pretty bits and word strips to decorate your family friendly pages! Watch your pages bloom in full wild color with this page kit that includes the elements detailed below plus 21 papers packed with gorgeous roses, classic stripes and dots and fun leopard prints and This portion of the LIVING COLOR collection includes the Papers and Pretties and coordinates perfectly with the Journal Cards. Althoughthe cards are available separately, some previews you see here show how well they play together! Stacked Pocket Cards are the new (and convenient) fad! Created for the scrapper with limited time, the time consuming work has been done for you! 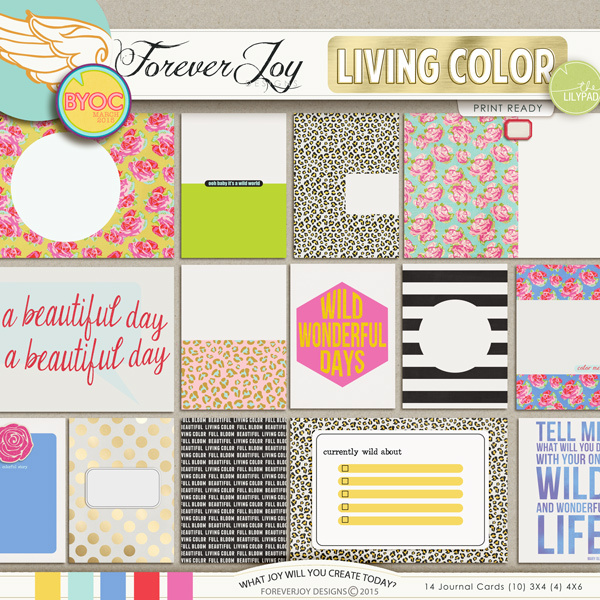 These pocket cards will add fun and dimension to your Project Life® Pages! Super for throwing your pocket pages together quickly! Included in this pack are 4- 3x4, 3 - 4x4 and - 6x4 unique cards designs . All files are in JPG format! This set of elements coordinates with the March 2015 BYOC and my Wildflower Paper Pack. The Oleander page designs feature plays with paper and shape, a love for layers and clean lines and are created with everyday storytelling in mind. So whether you’re in a time crunch, feeling a little un-mojo-y in the creativity department, or whether it’s your preferred launching point for scrapping your pages, these templates are a fantastic tool for scrapping pages you will love. You can use these templates as your creativity guides you and in whatever way suits your style and the story you are trying to tell. They are versatile and can be used time and again to achieve different results. a set of 47 elements that coordinate with the March 2015 BYOC. A set of 26 letters A-Z and numbers 0-9 that coordinate with the March 2015 BYOC. You receive individual PNG files of the colors seen and ABR brush set so you can easily use any color.